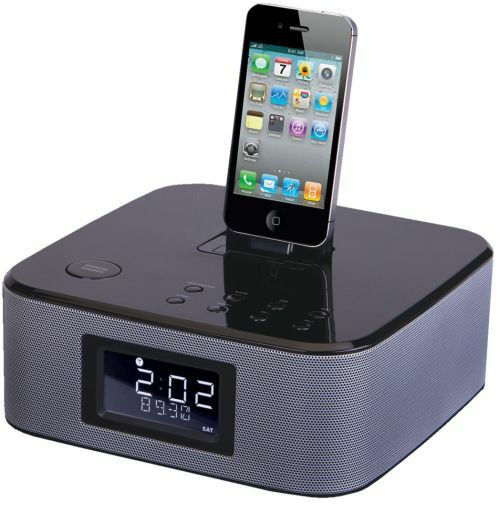 This iDock speaker system is a very compact unit that can accept your iPod, iPhone, or iPad as a source input, and keep them charged for endless hours of music enjoyment. You can also listen to the FM radio or hook up any other source via the 3.5mm jack. The stereo sound comes from two speakers on either side of the unit behind the metal mesh grills. Other features include an LCD display with backlight, a clock with alarm and sleep functions, and the option to wake up to the radio or your iPod, iPhone, or iPad. All controls are conveniently located on top of the main unit or control it from anywhere with the included remote control.